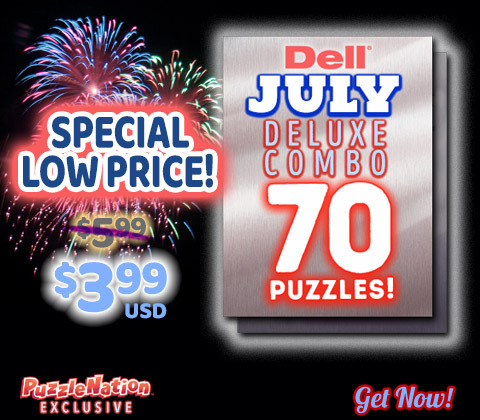 Special offer on July Deluxe Puzzle sets! We interrupt your hopefully mellow, relaxing, and enjoyable Sunday with some puzzly news! 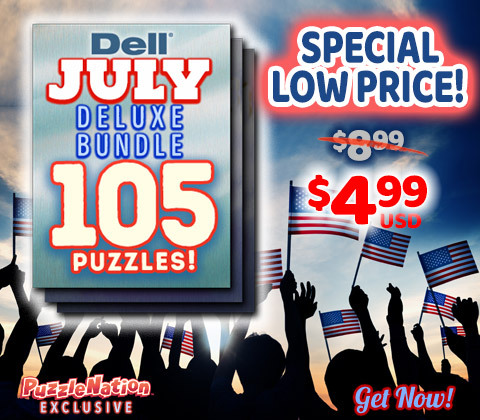 It’s the end of July, so we’re offering a terrific discount on the July Deluxe Puzzle Sets for the Penny Dell Crosswords App! Prices have been slashed on our July Deluxe Set, July Deluxe Combo, and July Deluxe Bundle! You get easy, medium, and hard puzzles, plus bonus July-themed puzzles! This offer is only available for a short time, and with in-app purchasing, you’re just a few clicks away from brand-new puzzle delights! You can’t go wrong with quality puzzle bundles like this! Snap them up today! This entry was posted in PuzzleNation, Puzzles and tagged About Us, Announcements, crossword, crosswords, deluxe bundle, Deluxe Combo, Deluxe puzzle set, games, Geeking Out, july bundle, july combo, july deluxe, July Deluxe Set, Penny Dell Crossword App, Penny Dell Crosswords App, Penny Dell Puzzles, Penny Press, Penny/Dell Puzzles, Pop culture, PuzzleNation, Puzzlin' fool, special offer, Wordplay by gmdirect. Bookmark the permalink.